04-08-19 Elizabeth, NJ - Firefighters responded to a report of a dwelling fire. First arriving companies had heavy smoke, issuing from the first floor with multiple people in need of rescue. As rescues were being made the fire made great headway and spread throughout the private dwelling. A second alarm was transmitted followed by a third, bringing mutual aid companies to the scene and to cover the city. 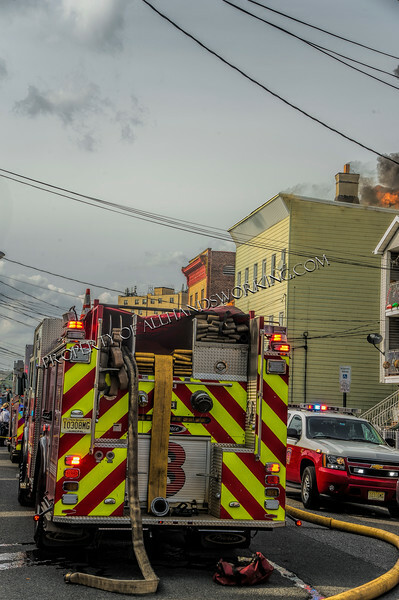 Conditions continued to deteriorate as the fire spread into the number two exposure. Firefighters made the interior attack on both dwellings. They had to be removed from the original fire building due to heavy fire conditions throughout. A defensive attack commenced for about an hour as the fire took hold of the three story, wood frame dwelling. Multiple hand lines were stretched and operated as well as an aerial and tower ladder. The fire took about two hours to bring under control. The cause of the fire is being investigated.